As we age and grow older, we all expect that certain changes occur in our bodies and outward appearance. One of these changes is that, sooner or later, most of us will experience is gray hair. While it is usual for people in their senior years to have gray hair, many women, and some men, find it worrying to discover premature gray hairs appearing. In fact, some men and women experience this in their late 20s. Scientists generally agree that after we reach our 30s the chances of gray hair appearing increase about 10-20% every 10 years. So, what causes hair to turn gray prematurely? If you have premature gray hair, is there anything that you can do to ‘cure’ it? So Many Questions: Why Hair Turns Grey? Our hair is made up of a protein called keratin and the reason our hair has color is thanks to a pigment called melanin. There are two basic types of melanin – dark and light, and they blend together to give our hair its color. 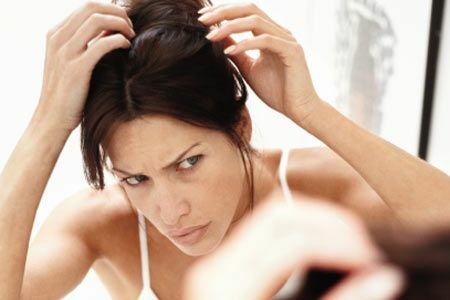 Sometimes we notice that during adolescence years and into our early 20s our hair changes color, usually darker. This is because the body starts producing different amounts of melanin. So, as long as the body continues to produce enough melanin, we keep our hair color. However, as we age the production of melanin slows down until the hair turns gray then white. So, the big question is, why does the body stop producing enough melanin? Scientists now think they have found the answer. For years, scientists have been trying to find why our hair turns gray and now they have found a gene which is linked to gray hair. A study published in Nature Communications was able, for the first time, to pinpoint a gene which is responsible for gray hair1. The research investigated around 6,000 people from Latin America who had mixed ancestry. It was found that the gene in question is connected to blonde hair in Europe. Professor Kaustubh Adhikari, who led the study, said that the gene they identified regulates and produces melanin and that melanin production in the body is determined by genetics2. The study concluded that this gene was the reason for about 30% of participants developing gray hair. The other 70% was due to other factors. Research has also shown that there is a definite connection to age and gray hair. Dr. Desmond Tobin, a professor of cell biology who also took part in the research that discovered the gene link to gray hair, published his own research on how age affects the pigmentation of hair. As we get older age and genetics regulate the decline in pigmentation of each hair follicle. He called this a “melanogentic clock”3. Now that scientists have established the reasons behind gray hair, it will be possible to conduct further research on solutions to both gray hair in seniors and premature gray hair. Genetics play a role in gray hair. This means that if there is a family history of premature gray hair, then it is most likely that this will be passed on. Dr. Desmond Tobin, mentioned earlier, discovered this in his research about age and hair pigmentation. There is a proven link between smoking and premature gray hair. The British Medical Journal carried out research into this link because smokers tend to have facial changes similar to those seen in premature aging, including gray hair.